I had this chicken mango stir-fry at one of my favorite Asian bistro restaurant the other day. I loved it very much that I decided to replicate at home within 20 minutes from start to finish. 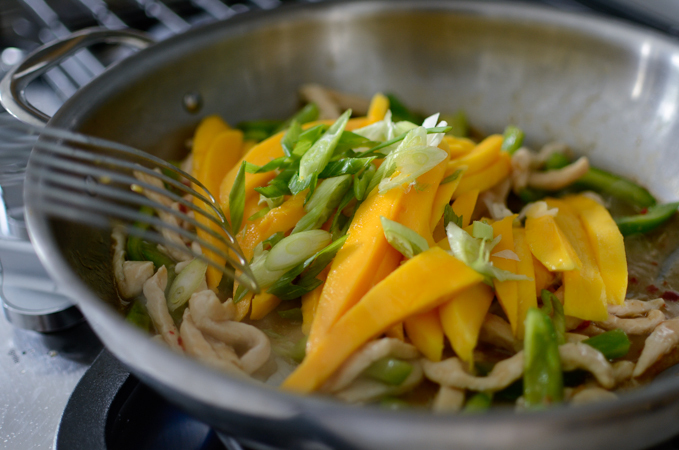 The sweet fragrant mango slices go so well with lean chicken breast. With the addition of crunch green pepper makes this chicken mango stir-fry to be a quick and easy weeknight meal. I am not a huge fan of sweet main dish, but this one is a keeper. 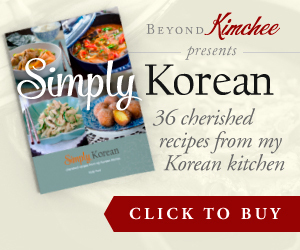 It is much healthier and quicker to make than any of those deep fried sweetened chicken dish. You will love the fresh taste with a hint of sweetness. A store bought Thai sweet chili sauce with a little bit of lime juice and fish sauce brings the flavor punch to the dish. 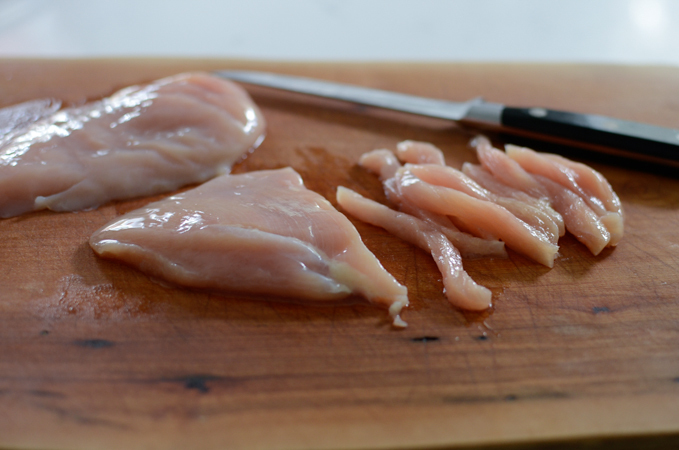 I like to slice the chicken breast into long and very thin strips. Same goes to pepper and mango. 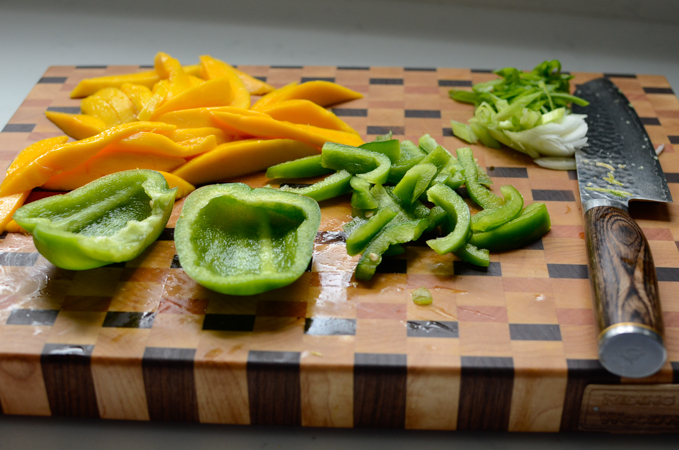 I would suggest to cut mango slightly thicker, though, so that they don’t break easily as you stir-fry. Stir-fry chicken first, then add the green pepper and cook until they are crisp tender. Add the sauce and stir. Add the mango slices and green onion at last, toss to coat well. That’s all there’s to it. A delicious chicken mango stir-fry was ready in 20 minutes. 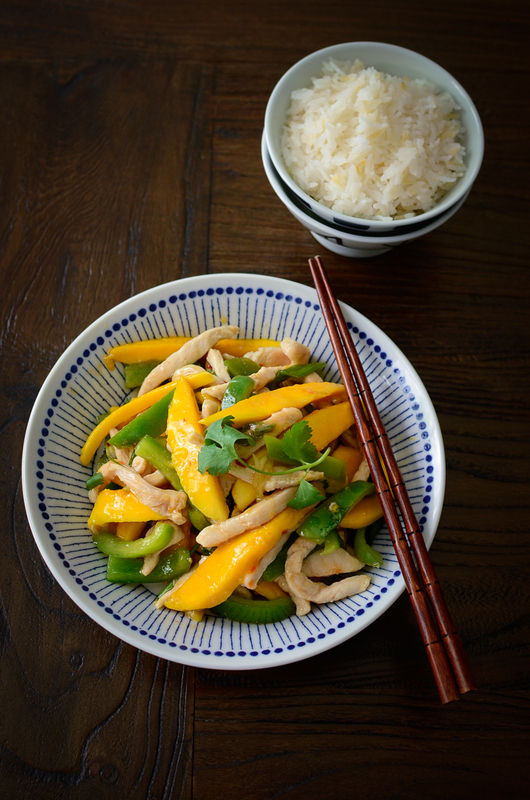 Tender chicken, crunchy pepper, and sweet mango, they all go together very nicely. 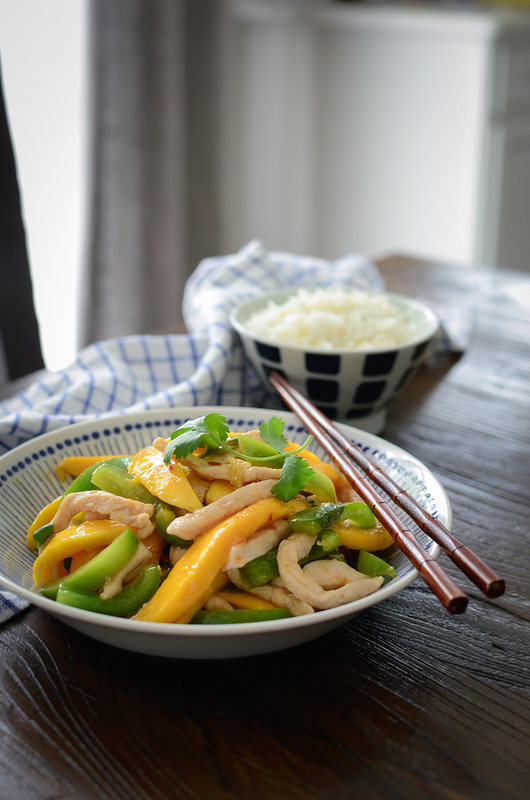 A bowl of steamed rice would be all you need to enjoy this scrumptious chicken mango stir-fry. Hope you enjoy. 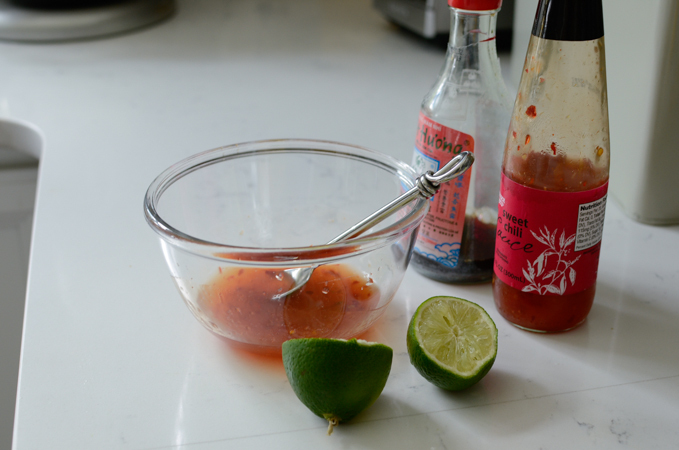 In a small bowl, combine Thai sweet chili sauce, fish sauce, and lime juice. Mix well and set aside. Heat oil in a skillet over med-high heat. Stir fry the chicken until fully cooked. 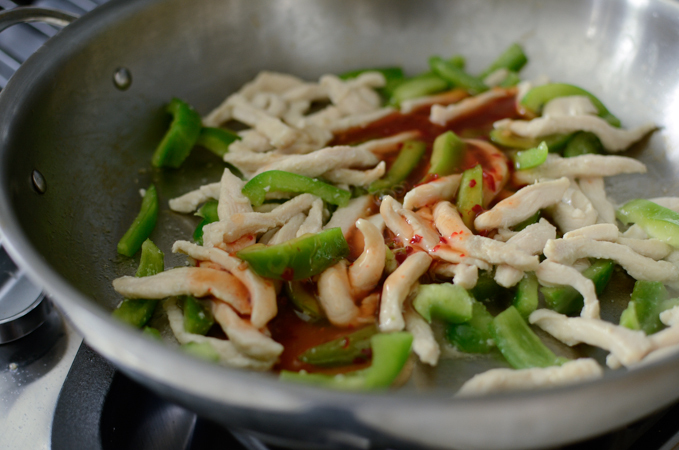 Add the green pepper and continue stir-fry until crisp tender. Add the sauce and toss chicken and pepper well. Add the mango and green onion and toss. Remove from heat and serve with steamed rice. I'm not usually a fan of sweet mains either, but who can resist a dish that's so bright and colorful? And it doesn't look THAT sweet. :-) Thanks! I am a fan of quick and delicious stirfries. Mango and chicken are fantastic together. Thanks for sharing, Holly.